Javier Mascherano has admitted failing to declare earnings. Barcelona and Argentina defender Javier Mascherano has appeared in court aiming to avoid going to prison over a 1.5m euros (£1.1m) tax fraud. Mascherano, 31, previously admitted two counts of fraud after failing to declare earnings in 2011 and 2012. 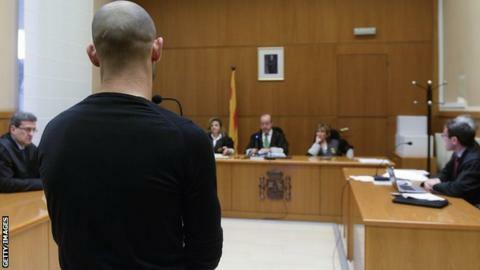 A judge will now rule if Mascherano can pay an increased fine to avoid jail, according to reports in Spain. He is alleged to have attempted to conceal earnings from his image rights by using companies he owns abroad. A court filing released last year confirmed the player had repaid 1.75m euros - the full amount plus interest. Following the latest hearing at a court in Catalonia, the former Liverpool and West Ham player tweeted a statement, saying: "I'm a sporting professional, I don't have a great understanding of taxes and law. "To deal with what are for me technical and complicated matters, I have to rely on other people. "Throughout all my career I have been an honest person, responsible and respectful of my team-mates and the clubs that I have played for and the countries I have lived in. "